BOSCO, Virginia, 90, of Ormond Beach, Fla., passed away Friday, April 5, 2019. A Mass of Christian burial at 10 a.m. Tuesday, April 16, in St. Francis of Assisi Catholic Church, 299 Clark St., Auburn, NY. Interment will follow. Calling hours from 2 to 4 p.m. Monday, April 15, at Cheche Funeral Home, 1778 Clark St. Road, Auburn, NY. AMBLER, Pa. — Major Matthew M. Wiegand, of Ambler, Pa., was killed in a night training accident on March 30, 2019. 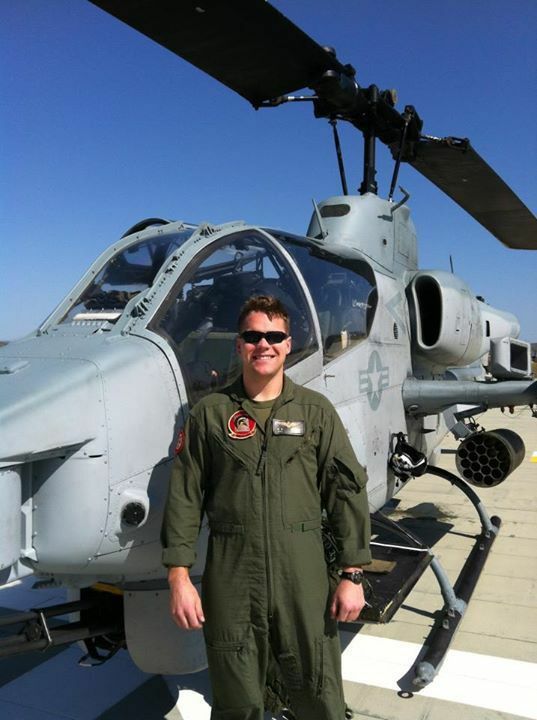 Major Wiegand and his co-pilot were flying the AH-1Z Viper as part of the seven-week-long Weapons and Tactics Instructor Course. The crash occurred in the vicinity of MCAS Yuma’s training areas, and the cause is still under investigation. Major Wiegand was hand-selected as an instructor to Marine Aviation Weapons and Tactics Squadron One (MAWTS-1) and stationed at MCAS Yuma, Ariz.
Major Wiegand joined the Marine Corps in 2008 after graduating from the U.S. Naval Academy and commissioned as a 2nd Lieutenant. He held the highest flight leadership and instructor qualifications in both the AH-1W Super Cobra and the AH-1Z Viper attack helicopters with nearly 2,000 flight hours. His previous duty stations include NAS Pensacola, Fla.; NAS Corpus Christi, Texas; and most recently Marine Corps Base Camp Pendleton, Calif., where he was assigned to Marine Light Attack Helicopter Squadrons 367 and 469. Major Wiegand previously deployed in support of the 31st Marine Expeditionary Unit; as well as twice in support of the Unit Deployment Program in Okinawa, Japan. He also participated in numerous bi-lateral exercises with Joint and foreign partners, including operations in the Philippines and South Korea. His personal awards include the Navy and Marine Corps Commendation Medal with gold star in lieu of second award and Navy and Marine Corps Achievement Medal with gold star in lieu of second award. Matt is survived by his beloved wife and best friend, Katrina; their sweet dog, Charlotte “Charlie”; parents, Margaret and Captain Roy A. (Skip), USN (Ret. ); aunt, Barbara Littlejohn; cousin, Craig Littlejohn; lifelong friends, Jeff and JD, and a band of brothers and sisters from the U.S. Naval Academy, the Marine Corps, the U.S. Navy, and the U.S. Army. Matt and Katrina shared a deep love for their dog, Charlie, their friends and family, and making each other laugh. They both enjoyed the outdoors, good music, comedy, and classic cars. Matt’s love for both teaching and learning extended beyond his time in the cockpit and the MAWTS-1 classrooms; he was often found soaking up new information and sharing it with anyone who would listen. Visitation for Major Matthew M. Wiegand will be from 10:30 a.m. to noon and from 5:30 to 7:30 p.m. on Tuesday, April 16, 2019, at the Ciavarelli Funeral Home, 951 East Butler Pike, Ambler, PA 19002. Funeral services will be at 11 a.m. on Wednesday, April 17, 2019, in Abington Presbyterian Church, 1082 Old York Road, Abington, PA 19001. Matthew’s final resting place will in Arlington National Cemetery. He will be buried with full military honors at 11 a.m. on Aug. 15, 2019. Contributions in Major Wiegand’s memory may be made to the Wingman Foundation, 10915 Via Brescia, Unit 909, San Diego, CA 92129. SALVA, Alfonso, of Auburn, passed away Friday, April 12, 2019. Friends are invited to join the family for a Mass of Christian Burial to be offered at 10 a.m. Wednesday in Holy Family Church. Entombment to follow in St. Joseph's Mausoleum. There are no calling hours. Contributions can be made to Hospice of the Finger Lakes, 1130 Corporate Dr., Auburn, NY 13021. Arrangements are by the Cheche Funeral Home Inc., Auburn. ORMOND BEACH, Fla. — Virginia Bosco, 90, of Ormond Beach, Fla., passed away Friday, April 5, 2019. She was born in Auburn, N.Y. on May 7, 1928. Virginia had been a resident of this area since 1963. She was very involved at her church, Saint Brendans, and helped to start the library there while she was librarian. She was a former member of the G.E. Wife’s Club and enjoyed artwork, painting and sculpting. Virginia had a beautiful, professional singing voice and was an excellent cook and baker. Virginia owned and operated Ginny’s Bakery Delicatessen, Ginny’s Fresh Fruit Ices, and Heavenly Scent Florist. Virginia was predeceased by her brother, Nicholas V. DeAngelis, killed in Normandy invasion World War II; her sister, Gloria Fanelli; mother and father, Lena and Charles DeAngelis; and mother-in-law, Margaret Bosco. She is survived by her husband of 68 years, Carmen; a son, Vincent; a sister, Norma Jean Stone, of Mobile, Ala.; nieces, Leah DeAngelis, and Lisa Zaccour and husband, James; a nephew, Scott C. Stone; and a great-nephew, Jack DeAngelis. Services and interment will be held in Auburn, N.Y.
A Mass of Christian burial for Virginia will be celebrated at 10 a.m. on Tuesday, April 16, in St. Francis of Assisi Catholic Church, 299 Clark St., Auburn, NY. Interment will follow. Friends wishing to call and pay their respects may do so from 2 to 4 p.m. Monday, April 15, at Cheche Funeral Home, 1778 Clark St. Road, Auburn, NY. RESTON, Va. — Madeline Crawford Flynn, a longtime resident of Reston, Va., died at home on Friday, Dec. 21, 2018. The youngest child of Emerick Brewster Crawford and Edwina Greist Crawford, she was born at home during a blizzard on Feb. 9, 1933 in Hamden, Conn. The family, including siblings Ronald and Susan, moved from New England to Auburn, N.Y. in 1942, and “Maddie” went to public school there until attending The Shipley School and later, Smith College. Madeline married Peter A. Flynn (also an Auburnian) in 1952 during his undergraduate studies at Yale University. Through Peter’s subsequent medical school at Yale, internship at Philadelphia General Hospital and U.S. Navy medical career, Madeline was devoted to raising six children and making the constant adjustments which military life demanded, including moves to Florida, Virginia, South Carolina, and a 15-month period when Peter was stationed on an aircraft carrier in the Mediterranean. She delighted in celebrating all major holidays and birthdays, taught preschool in the '70s and '80s, contributed her time and talents to a number of service organizations including the Very Special Arts Festival, and sang with the Reston Chorale for more than 40 years. The family’s annual group vacation on Fripp Island, S.C. was a cherished tradition. Madeline is survived by her husband, Peter; their children, Deborah Flynn-Hanrahan (Tim), Barbara Flynn (Mike Prewitt), Sally Stewart, Peter A. Flynn Jr. (Tina), E. Paul Flynn II, and Tim Flynn (Vicki); 10 grandchildren, and five great-grandchildren. A celebration of Madeline’s life will be held on May 11 in Reston, Va.
AUBURN — Veronica Hall, 101, of Auburn, passed away peacefully Wednesday, April 10, 2019, at The Commons on St. Anthony. She was born in Weehawken, N.J., the daughter of the late Patrick and Delia Duffy Weir, and had resided most of her life in Union City until moving to Auburn in 2005. She was a very devout Catholic having attended religiously in her later years at St. Mary’s Church in Auburn. She worked various jobs in her earlier years and was most proud of helping our veterans during World War II and securing the safety of our children as a longtime crossing guard. Veronica or “Miss Victory,” as she was known for her support during the war was a very proud, patriotic woman that would bleed red, white and blue if she could. Veronica also enjoyed reading the newspaper and watching any movie that had John Wayne in it. Veronica’s feisty attitude and infectious smile will be always remembered and truly never duplicated. She is survived by her loving daughter, Veronica Benson; and close companion, Herb Fritag, of Skaneateles; as well as other nieces, nephews and cousins. In addition to her parents, Veronica was predeceased by her husband, Howard; nine siblings; and a half-sister. There are no calling hours. A memorial Mass will be held at a future date and time. Arrangements are by Pettigrass Funeral Home. NAPLES, Fla. — William Daniel Fitzpatrick, native of Auburn, N.Y., and 19 year resident of Naples, Fla., passed away peacefully on April 7, 2019, surrounded by his family. Bill was born in 1941 and grew up in Auburn, N.Y. He was the fifth child of Stella (Bannon) and Joseph Fitzpatrick. Throughout his life, Bill used his competitive energy in small and large sporting games, eager to be part of a team. He excelled in athletics, achieving a scholarship to Boston College, playing fullback on the football team and earning a degree in marketing. He later married Mindy (O’Hora) — whom he met at his eighth grade graduation, and returned to Auburn, N.Y. to raise his three daughters in his beloved hometown. Bill was an educator and coach in the Auburn School District, mentoring students throughout their young adulthood. He also was elected and served as supervisor for the town of Sennett. Bill held dear the lifelong friendships with his fellow “Auburnians,” enjoying their gatherings in Naples. He delighted in Monday Night Happy Hour, a different place each week, with treasured neighbors right up until this March. Bill’s love for Boston College radiated within him throughout his years of attending football games as a season ticket holder; in addition to alumnae events and reunions. He cherished his time spent with his “BC Eagle” buddies and valued their friendships highlighted by the St. Patrick’s Day festivities in Naples. His love for exercise and the outdoors continued in the sunshine along the sands of the Gulf Coast. The cocktails, dinners, and especially conversations he shared with folks from Sandollars of Naples and IslandWalk were enjoyed and appreciated by Bill. Those fortunate enough to have known Bill will remember him for his gentle soul and his compassionate, witty personality. With a laugh so infectious, his happiness spread to everyone around him. Bill’s love for his family has been passed on through his grandchildren, who will remember him chewing gum, cheering them on at sporting events and fishing. Bill is survived by his wife, Mindy; their three daughters, Mary McDaniels, of Lorton, Va., Micki Hogan, of Westfield, N.J., and Maureen Mammen, of Cranston, R.I., each of whom passed on his daily mantra “something wonderful is going to happen to you today;” his sons-in-law, whom he loved for their dedication to his daughters and their children, Jeff McDaniels, Joe Hogan, and Tim Mammen. Additionally, he leaves seven grandchildren in whom he delighted, nurturing their sense of kindness to each other and their parents, Jeffrey, Megan, and Jack McDaniels, Kelly, Kerry, and Gracie Hogan, and Raj Mammen. Other surviving family members: eldest sister, Marcia Fitzpatrick Hares; brothers-in-law, James Mitchell DDS, Edward McCarthy, and Michael O’Hora; sister-in-law, Maureen O’Hora Patterson; dear cousin, Betty Badran; and cherished nieces and nephews and friends. A funeral Mass celebrating Bill’s life will be held at 11 a.m. on Monday, April 15, 2019, in St. Agnes Catholic Church, Vanderbilt Beach Road. Bill left for college on a Greyhound bus with one suitcase tied with rope. His appreciation for the gift of an education to a poor young man can never be overstated. In lieu of flowers, donations may be made for an award to young men graduating from Golden Gate High School in 2019 who will continue their education while playing football. Make checks payable to Community Foundation Scholarship, 1110 Pine Ridge Road, Naples, FL 34108, noting in memory of Bill Fitzpatrick. GAGLIANO, Louis R., 79, of Auburn, passed away Thursday, April 11, 2019. There are no calling hours. A private service and burial will be held at the convenience of the family. Arrangements by Pettigrass Funeral Home. AUBURN — Douglas F. Riley died Thursday, April 11, 2019. He was predeceased by his parents, Clara and Charles Riley Sr.; his daughter, Elaine Stewart; his brother, Charles Riley Jr., and his mule, Ramie. Douglas is survived by his loving wife, Elinor Riley, of Auburn; his son, James (Florence) Riley, of Sennett; his daughters, Sharon Riley, of Auburn, and Judy (Ken) Davis, of Auburn; his brother, Norman (Margaret) Riley, of Ohio; his grandchildren, Brandon (Liz) Stewart, Kim (Ken) Rink, and Jeff (Anna) Riley; five great-grandchildren; and a special son-in-law, Rick Stewart. Douglas was born in Sennett in 1920 and operated a dairy farm on Depot Road with his brother, Norm, for many years. In 1946 he joined the Sennett Volunteer Fire Department, and until his death was the only living charter member. In 1955 Doug left the fire department to run for the town council of Sennett. Shortly after he became a member of the Sennett Town Board. Doug served on the town council for 25 years. In 1996 he was elected to the town assessor position. After selling the farm he worked at various jobs including Frazer & Jones Co., Ward Trucking, and Auburn Tank. One of his proudest achievements was going to Mississippi to help rebuild homes after Hurricane Katrina. Doug went on many trail rides on his mule, Ramie and loved every minute of it. His favorite times were at Bear Swamp with Ramie and his uncle, Howard. Doug was the “Mr. Fix It” of Sennett. If it was broke he could fix it. He graciously remembered those with whom he was associated and enjoyed and loved doing anything for anybody. Calling hours for Doug will be held from 2 to 4 p.m. on Monday, April 15, in Sennett Federated Church, followed by a funeral service at 4 p.m. Donations in Doug’s memory may be made to Sennett Federated Church, 7777 Weedsport-Sennett Road, Weedsport, NY 13166. Arrangements are with White Chapel Funeral Home, Weedsport. AUBURN — Sonja A. O’Brien, 90, passed away Monday, March 25, 2019. She was born in Hamburg, Germany, on June 19, 1928, and later moved to Brussels, Belgium. After fleeing Belgium with her parents in May 1940 to escape World War II, she grew up in New York City where she graduated from Fordham University with a degree in biology. After graduation she worked at Pfizer Pharmaceuticals. In 1952 she married Dr. Francis R. O’Brien. After spending two years at Fort Eustis, Va., where Dr. O’Brien was stationed in the army, they moved with their then four children to Auburn, N.Y. Shortly after moving to Auburn they purchased a nearby farm where they would spend the rest of their lives. She loved animals and was always surrounded by dogs, cats, horses, fish, cows, and often one or more monkeys. For many years she and her favorite horse participated in barrel racing and goat tying events. Model trains was another hobby where, for more than 50 years, she hand-built elaborate layouts that filled entire rooms. And she always had time for tending flower gardens, a swimming pool, and an ornamental fish pond. An annual trip to Mexico in their motorhome allowed her to practice her Spanish and explore the Mayan ruins. After a serious stroke in 2008 she contented herself with mowing the vast lawns at the farm, working on puzzles and watching old western movies in the evenings. But she never lost her sense of humor. She is survived by three sons, Timothy (Paula) O’Brien, of Auburn, Richard (Ruth) O’Brien, of Bothell, Wash., and Thomas (Susan) O’Brien, of Weedsport; three daughters, Patricia Hotaling, of Hannibal, Barbara (J. Stephen) Bonilla, of Orlando, Fla., and Susan O’Brien, of Elbridge; 20 grandchildren, and 10 great-grandchildren. She was predeceased by her husband of 60 years, Dr. Francis O’Brien, in 2012, and by an infant son, Michael in 1961. There were no calling hours. A Mass of Christian burial was held for family members and close friends on April 1, in Holy Family Church in Auburn. Interment was in St. Joseph’s Cemetery, Fleming. Donations in her memory may be made to Hospice of the Finger Lakes. Sonja will be greatly missed by her family, friends, and her beloved animals. Arrangements are by Farrell’s Funeral Service, Inc., 84 South St., Auburn. RILEY, Douglas F., died Thursday, April 11, 2019. Calling hours from 2 to 4 p.m. on Monday, April 15, in Sennett Federated Church, followed by a funeral service at 4 p.m. Donations to Sennett Federated Church, 7777 Weedsport-Sennett Road, Weedsport, NY 13166. Arrangements are with White Chapel Funeral Home, Weedsport.